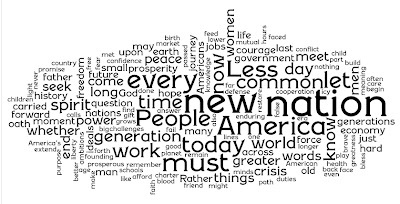 I love playing Wordles anytime but I love the way the words new, nation, people, and America were grouped on this one. What a great souvenir of the day. It was very much a speech of the here and now - and I see now, new and today are fairly big words there. That's really nice, go Team America! Susan: I'm with you on that - what impressed me was how quickly they had it done, and then comparing it to Bush's one! People are very much on the ball. AJ: Agreed. The speechwriter is obviously someone in tune with Obama. Great article about him in the Irish times the other day, while the New Yorker had a critique on the prose style.